This weekend I learned about a very big, very fancy event to which I desperately want to go--an 18th century costume ball at the Hall of Mirrors at Versailles. The only problem is that I do not have a ready 18th century ensemble to wear. While I waited for a fairy godmother to show up, I started thinking about what costume pieces I have already made and how I could make them work for this event. I already have a shift, stays, bumroll, and petticoat intended to be worn under a robe a l'anglaise. 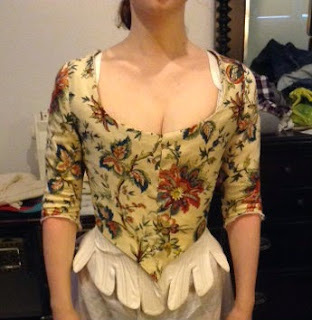 Then I remembered I have a bodice started years ago for the Festive Attyre "Curtain Along." The Waverly fabric is a bit too casual for the event, but if I could dismantle it and treat the bodice as a muslin, I might be able to very quickly copy it in a fancier fabric. The pattern calls for a drawstring to be run along the neckline, and that has not yet been inserted. Also, the straps on my stays are way too wide, which is part of the reason they're creeping in like that. I've since cut them down as much as possible and I'm hoping that helps.